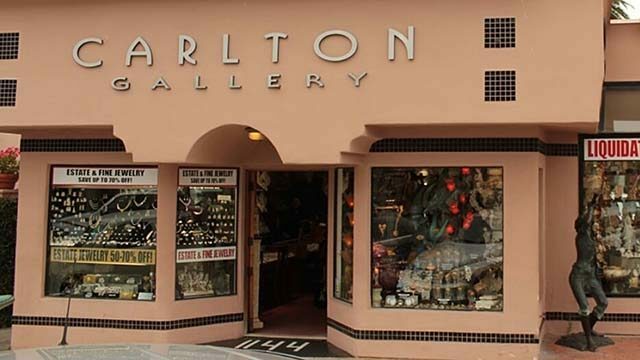 The Carlton Gallery in La Jolla, its owner and an employee are facing criminal charges for allegedly trafficking $1.3 million in illegal ivory, San Diego City Attorney Mara Elliott announced Wednesday. Elliott’s office has been investigating the Carlton Gallery since May 2017 and performed a sting operation on the business on May 1 of this year, with the help of wildlife officers from the state Department of Fish and Wildlife. Officers seized 146 items containing ivory from the gallery and 192 from a nearby warehouse during the sting, authorities said. In addition to the gallery itself, gallery owner Victor Hyman Cohen and salesman Sheldon Miles Kupersmith, who allegedly sold ivory to undercover officers, were charged as individuals. A person answering the phone at the Gallery Wednesday afternoon declined to comment. California banned virtually all ivory sales in 2016 via a state law authored by Sen. Toni Atkins, D-San Diego. The ban includes the teeth and tusks of elephants, hippopotamuses, mammoths, mastodons, walruses, warthogs, whales and narwhals and rhinoceros horns. According to the City Attorney’s Office, a majority of the seized items contained ivory from elephants and some contained ivory from hippopotamus teeth. “Seizing more than 300 pieces of ivory as evidence valued in excess of $1.3 million is representative of innumerable elephants and other species of wildlife poached for their ivory,” said David Bess, deputy director and chief of law enforcement for the Department of Fish and Wildlife. Under state law, a first-time offense of the ban is a misdemeanor punishable by up to a year in jail and a fine of up to $40,000. Kupersmith was charged with eight counts of the purchase and sale of ivory and rhinoceros horn and eight counts of the unlawful importing, possession and sale of a specified species. Cohen and the Carlton Gallery are charged with 11 counts of each.